« Man – I hope life is slowing down! Cast by the eerie silver light of the full moon, the thick shadows stir and writhe. Trees seek out to grasp the unwary and vines reach for a chance at an ankle or foot. The veil grows thin between the land of the living and the land of the dead as the world seeks to enter its fallow time, the time of waiting, of fear and of hope. In one secret clearing, the final rays of the setting sun vanish. 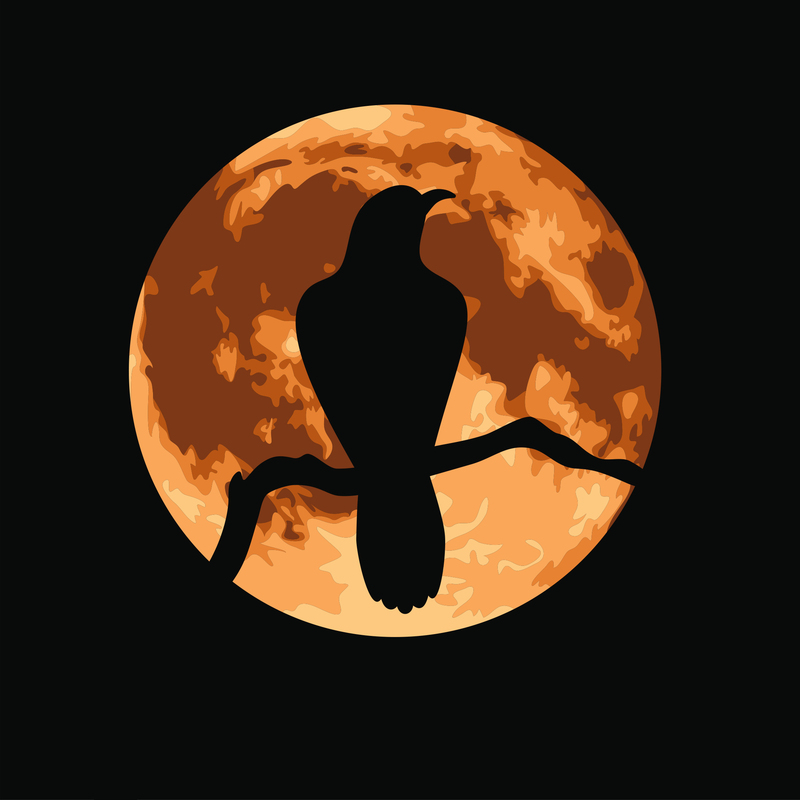 Shadowed against the Samhain moon and the roiling mist, the shape of a crow appears, cawing and screaming an otherworldly summons to the now still sky. The crow’s red eyes glisten like drops of blood in the moonlight. Then another appears, and another, until the sky is filled with their ebon shapes, diving and rising in a terrible chaos. As one, they scream a last time and dive to the ground, disappearing under the thick fog layer. It is time. It is his time. A few breaths pass, then another few in the now silent clearing. Finally a huge male figure stands up through the fog. His skin glows a midnight blue-tinged black, shiny and smooth as a raven’s breast and his long hair trails down his back as if formed of a thousand crow feathers. A mighty stretch and he tilts his head back and screams a demand, his crimson eyes bright with anticipation. First one, then two, then more and more appear. Ravens and crows alight on his shoulders and arms and whisper to him the secrets they have learned and the sights they have seen. He takes their knowledge as his due and murmurs back to them their new task, what his creatures will do in his service for the next year. Each one’s eyes glow with a brief flash of red, then return to black as they wing their way to the next task. For he is Corvus, King of the Crows. Eons have passed and his creatures have roamed the earth, gathering knowledge for him and even serving others at his behest, only to return to his ear to tell him what tales they have learned in that service. Some of his own served the One-Eyed God, Odin and some served the Goddess Morrigan as her battle-standard. Others have appeared as gods to peoples not yet named by their future conquerors. Yet even the gods fear him and the creatures he commands for he can see clearly through the veil between the worlds. When one is called, be it god or man, his creatures are there to gather the final knowledge and thoughts of the dying before they traverse the veil. Even the eyes of the dying can be taken in order to steal their final visions before they fade from the flesh or their tongue taken to rob them of their final words. Yet he searches on, searches for a way to remain in a single being, in this body he can take but for one brief night. Already dead, he cannot remain longer in the land of the living. Yet the magic of his birth leaves him unable to remain in the land of the dead. Cursed to this existence, his only desire is to find the knowledge he needs to become whole for all time. Finally the last crows have taken their leave of their master and the faint hint of sunrise brightens the horizon. It is time. Samhain night is over and so is his time here for this year. The first ray of light strikes his ebon skin and a great scream of rage and pain erupts from his throat only to trail off as his body disintegrates into a mob of hundreds of crows, red eyes blazing. Flying, spiraling and diving through the air, they caw in anger as their eyes fade to black and they take flight again to their homes in the graveyards and cairns of the world. There to watch and wait for another year. This entry was posted on Friday, October 9th, 2009 at 12:01 am by Maura Anderson and is filed under Free Story, Friday Flash. You can feed this entry. Both comments and pings are currently closed. Wow! Great excerpt. And the story line is very intriguing. I’ll be checking this out. I should say checking this out if you ever right an entire novel on this concept. Thanks! I’m sure Corvus will appear again somewhere but I can’t yet predict where.